CHRISTOS DIKEAKOS WAS BORN IN THESSALONIKI, GREECE IN 1946, AND MOVED TO VANCOUVER IN 1957. HE STUDIES AT THE UNIVERSITY OF BRITISH COLUMBIA, GRADUATING IN FINE ARTS IN 1970. DKEAKOS’S PHOTOGRAPHS, ASSEMBLAGES, PUBLICATIONS, AND PUBLIC ART HAVE BEEN EXHIBITED THROUGHOUT CANADA, NOTABLY AT THE NATIONAL GALLERY OF CANADA, THE VANCOUVER ART GALLERY, THE WINNIPEG ART GALLERY, AND THE MUSEUM OF CONTEMPORARY ART IN TORONTO. HIS WORK HAS BEEN EXHIBITED INTERNATIONALLY AT VENUES THAT INCLUDE THE ICA PORTLAND OREGON, THE MUSÉE D'ART MODERNE DE LA VILLES DE PARIS, AND THE BRISBANE ART GALLERY, AUSTRALIA. HIS WORK RESIDES IN THE PERMANENT COLLECTIONS OF THE NATIONAL GALLERY OF CANADA, THE VANCOUVER ART GALLERY, AND NUMEROUS PRIVATE AND PUBLIC COLLECTIONS. Nothing in Vancouver can be taken as permanent – the foreground or background in my pictures can attest to that. 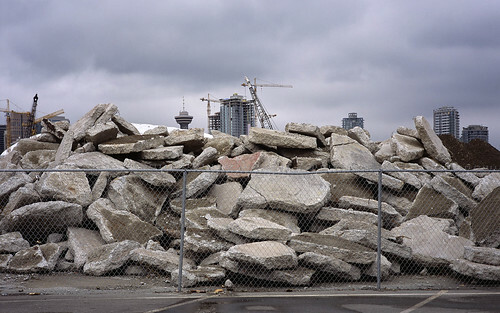 I have been photographing the unstable nature and exhausted landscape of the False Creek area of Vancouver since the late 1960s. Prior to the colonial encroachment of this waterfront inlet, which cuts and separates what is now the peninsular modern downtown, this site was traditionally occupied and extensively used by First Nation peoples as a fishing and hunting grounds. My extensive project from the early 1990s, “Sites and Place Names Vancouver,” deals with the dichotomy of place of the new metropolis, and of the aboriginal cultures that precede and overlap with it as in many cities across North America but especially in Vancouver. The panoramic photo of “sturgeon fishing” in the False Creek area (Figure 2) is overlaid with a sandblasted drawing on glass, originally drawn in the 1930s by a local and well respected chief. While the drawing evokes his deep memories and the travails of catching fish that could weigh as much as 150 kilograms, the photograph depicts a large rain puddle, suggesting the old waterway partially filled in for railway expansion and “resource extraction processing,” such as sawmilling in the early days of the city. This photo-and-glass installation work can be taken as a starting point to considering the transcendental dimension to nomadic homelessness, the idea of never being at home.